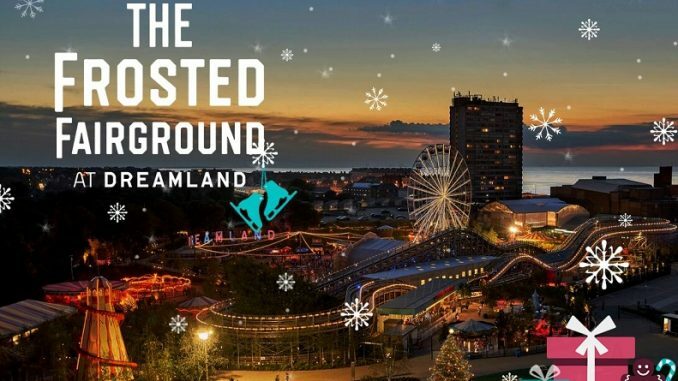 Dreamland’s Frosted Fairground returns for the third year and will include a 450-metre ice rink. The rink will be open every day from December 1 to January 3 (except Christmas Day) and will have room for 150 people to skate at one time. The winter weather won’t affect the fun as the rink is undercover, with a clear roof and walls for taking in the sights at the winter-themed amusement park. Tickets available here. The Frosted Fairground will also have a special appearance by favourite Christmas characters The Snowman and The Snowdog, a grotto, live music and special seasonal food and drink. This the first edition of The Frosted Fairground since the park’s redevelopment. The amusement park will open on the first two weekends in December, then every day from December 16 until January 3, 2018 (closed on Christmas Day). December 21 sees a special appearance from favourite characters, The Snowman and The Snowdog, at the amusement park. Arrive early to avoid disappointment and don’t forget to bring your camera! More info here. A magical experience awaits families and believers visiting the grotto at Dreamland. With elves, crafts and a sing-along with Father Christmas himself all topped off with a gift for each child. Tickets available here. Compering the stage throughout the Christmas period will be Jack and Jackie Frost. They will be hosting sing-a-longs, reporting on the likelihood of a white Christmas, playing Christmas number ones at 1pm and even having a light switch on every day. Rebecca Ellis, Director of Events and Programming at Dreamland Margate, said: “It’s been a very exciting year at Dreamland and ending it by providing an amazing festive experience at the park is really important to us.